Driving through Morocco on a big bus and with a long lens. When a place you never dreamed of being able to go becomes your yearly tradition. 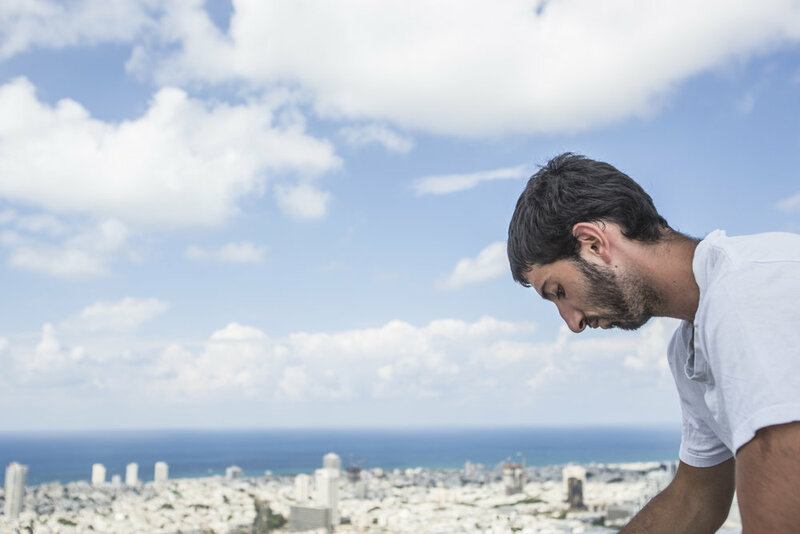 Our guide in Tel Aviv took us to a lovely viewing deck above the city and then we began to look for ways to get onto the roof. Luckily someone had left the door open and we walked right up there. Fifty stories high on a beautiful sunny day. I found it interesting that although we were breaking the same rules as individuals I wasn't as nervous about getting caught since there were more people involved. Logically I understand that the consequences are the same no matter how many people are involved. When shooting on roof tops we are very conscious of not breaking and entering. All doors were unlocked and accessible. Although it might have not been meant for the public we didn't break any rules getting there (depending on the country, rules will vary). As it turned out, no one saw us or no one cared and we still felt like we were in our own personal spy movie. Ive never had a fear of heights. I have the natural, healthy, fear though. It still makes my stomach turn when I watch some of Jason's videos like the one below. However, If I have a camera it creates a divide where I am more focused on what I am shooting than how the drop is making me feel. I don't think I could go around with these guys on ledges and just be a spectator. Photography is really essential to me being able to stomach it all. Looking back on these photos I am aware how I have gotten accustom to posting to instagram. I remember trying to post twice a day was such a challenge but with a few months practice it become easier and easier. Now its like second nature. When I got out and shoot I have my shots for Instagram in mind. As my instagram posting has improved, I feel like my other channels may have suffered, and maybe even my photography. Its a challenge to make a story out of this very adventurous trip but I am missed the images to go with it. Starting the Vlog with Jason in June might have contributed too. I am now shooting video and we are putting together a story through that median as well. My new challenge is to work on shooting the story and share it here on this vlog with you. This Hotel used to be frequented by Elvis, now it's abandoned. Jason Paul, Abudi Alsagoff and I traveled outside of Dubai to Umm Al Quwain, to find an abandoned plane. It was just too tempting and the rumors too good. Could this be a plane that use to carry illegal weaponry for Viktor Bout? The man aka "The Merchant of Death" and the main inspiration for the movie 'Lord of War' who is currently serving time in prison? And if not, seeing a huge abandon plane falling apart in the middle of the desert sounded pretty cool. Originally we wanted to shoot a video with the plane but after scouting we realized it was in no condition to take the weight of the jumps and moves for a video and instead we planed for a photo shoot. We woke just before 5am to get an early start and drive to the location about an hour away. Our hopes and dreams were to get some magical shots in sunrise with this huge plane. However, once we arrive we stayed in the car till the sun rose high enough to give us light to see through the overcast weather. We didn't get any epic sunrise shots but, what we got instead was more time with less contrasting light through out the day to get what we needed. Being inside a huge plane that is clearly falling apart (it had been stripped of all valuable items, which probably didn't help) is such an eerie feeling. These things are suppose to carry us in the sky? I was amazed that there weren't any bugs. Where I am from this place would have been crawling with spiders and insects but, here in the desert there were just birds and lots and lots of bird poop. We got a few photos inside while we waited for the weather to clear up but I felt like I needed to keep getting fresh air. Being on top of a plane was such a cool feeling. Its like having fun somewhere you know you aren't suppose to, like when I was a kid and my father would let me watch 1980's Eddie Murphy comedies (Beverly Hills Cop, Coming to America) with him as long as i didn't tell or get caught by my mother. For the athletes, the plane was challenging and at times limiting. It was slippery and dusty with untrustworthy areas. Ideas that had to be ruled out due to not being safe. Still, I feel like we were able to create some amazing images with the diversity of their skill, bravery and talent to adjust to these places.